San Sebastián, Spain—just 25 kilometers from the French border—is the easiest Spanish city to reach from France, making a trip to this hip coastal spot a no-brainer. Enjoy a seaside day at La Concha Beach, one of the best city beaches in Europe. Mix some Spanish culture into your French vacation by mingling with the locals in world-renowned restaurants, pintxo bars, and upscale shopping boutiques. And no need to stress about border patrol, this border-free ​Schengen zone allows you to walk across with ease. But do have your passport available for the occasional police check. The two cities of Biarritz and Bayonne are well connected to San Sebastián by bus and local tour guide companies. A bus ride from Biarritz or Bayonne (Bayona in Spanish) to San Sebastián takes just over an hour and costs around 7 or 8 euros. There is no direct train from Biarritz or Bayonne to San Sebastián. 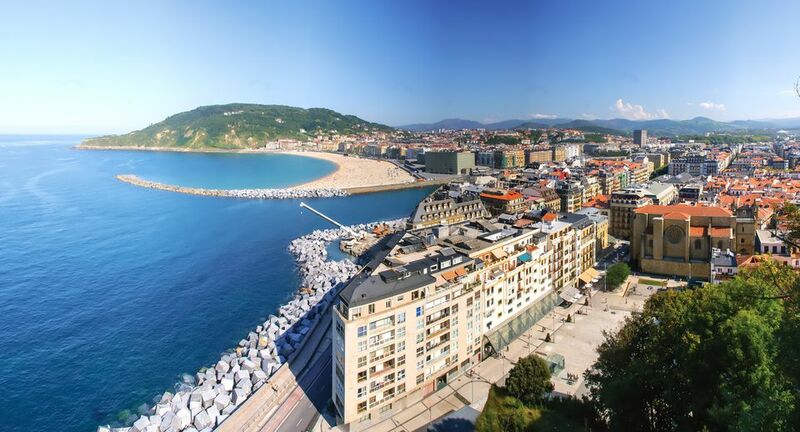 Instead, take a train to Hendaye, and then hop on the local Euskotren service to San Sebastián. The 50-kilometer car journey from Biarritz to San Sebastián takes about 40 minutes on the toll roads A63 and A-8. Plan an overnight trip from Bordeaux to San Sebastián since the 250-kilometer jaunt is quite the excursion. The best way to get there from Bordeaux is by bus, which costs less than 50 euros and takes 3 hours and 30 minutes max. (All the lines leave at an ungodly hour of the morning, however). Again, there are no direct trains from Bordeaux to San Sebastián—the nearest direct line is from Hendaye (Hendaya in Spanish), just over the French border. To get to Hendaye, take a direct line from Bordeaux and then walk across the border to Irun, Spain to catch a train to San Sebastián. The journey from Bordeaux to San Sebastián by car takes approximately 2 hours and 30 minutes. Take the A63 to the A-8. Getting to San Sebastián from Hendaye (Hendaya in Spanish) is easy since it's right on the border. Simply walk across to Irun, Spain to catch the Euskotren local train. Trains run throughout the day and tickets cost just a few euros. These tickets can only be booked in person at the Euskotren station, though. And note that the Euskotren is not affiliated with Renfe, the main national rail network in Spain, so don't try to use your rail pass. There are no buses from San Sebastián to Hendaye but it's about a 30-minute drive by car on the A-8 highway. The French capital of Paris is quite the trek from San Sebastián. Still, the journey is not impossible, especially if touring Europe is your ultimate mission. To take the train, hop on a Rail Europe route that leads to Hendaye, walk across the border, and then take the local line in. The total journey (including connections) takes about seven hours and costs around 100 euros. The bus from Paris to San Sebastián takes about 11 hours and costs less than 80 euros. Buses run every other day on an overnight trip via Bordeaux, Tours, and Orléans, which all make great stops if you choose to break up the journey. The 800-kilometer drive from San Sebastián to Paris takes about seven hours on the A63 and the A10 toll roads.